Perhaps a fire-breathing Elmo should be in order? that would be great if you could make it rip its own head off. Or put a switchblade in the hand that keeps going up and down. Now thats good entertainment, elmo killed a care bear. 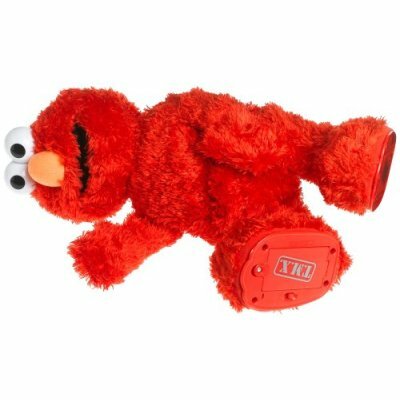 Did anyone see the clip of Rosie O helping Elmo get one off? That's disturbing! Sleeping is going to be tough tonight. this elmo looks hilalrious. my sister's boyfriend is buying one for my little brother. that is going to be kind of annoying. BUT funny. You should dye its hair black, make its eyes red, slow down the laugh to make it more demonic like beautiful women suggested, make it shoot flames out of its mouth like the roboraptor, stitch wings onto its back and give it claws! That would be worh buying! I want to see one naked - fur gone. I think that in itself would be scary. I found what I think is a spelling error in the Tickle me Elmo article. I will put the error in triple quotations, and the correction in triple brackets after the error. Please disregard if I am mistaken. I don't mean to be rude, just thought I'd mention it for PopSci's benefit. I m immune to tickling. Usually I don't learn article on blogs, however I wish to say that this write-up very pressured me to check out and do it! Your writing style has been amazed me. Thanks, very great post. It’s really informative stuff. I really like to read. Hope to learn a lot and have a nice experience here! my best regards guys!